I read Lorna’s Sew Fresh Quilts blog and am constantly in awe of the patterns that she designs. I am amazed by creative people that can design something from nothing, that’s not me, I can follow a pattern, but not create one so to me, those that create are amazing! I had this wild hair idea to make the “littles” a bed pillow ( in addition to the traditional pillowcase) from one of Lorna’s patterns. After all, there’s cats, dogs, horses, cars, trucks… all favorites of one of the “littles”. But, Sam loves trains and there were no trains. What to do…? Well, I did something I’ve never done before, and am still kind of shocked that I did it! I emailed Lorna and suggested that if she had a running list of ideas, I sure hoped there was a train on her list because I knew a little boy that would LOVE a train. Lorna graciously replied, said she would put it on her list, and I continued to get ready to Christmas. I realized that I was foolish trying to think I could make pillows for the kids, and decided to put that idea on the back burner. Well, 2 days later, I got another email from Lorna WITH A TRAIN PATTERN!!! I was so shocked, amazed, excited that of course all the good common sense went right out the window. I HAD to make that train. One Day!!! This is a winner, and you have a wee girl waiting for something of her own too? He is so adorable. That pillow is SO cute, no wonder Sam is thrilled with it.Congratulations on your blog, and good luck to you. I too have stumbled into blogland this week with the encouragement of my daughters. See you there. How exciting for your grandson to have a train pillow. Lorna has this technique down pat for designing. I came to your blog via Lorna’s blog. Happy stitching in 2018. Thank you, Gretchen. I have a sister named Gretchen, it’s not a common name! Happy 2018 to you too. Hi Dorothy…that is a lovely pillow and your little grandson seems over the moon with it. Thank you, Karin, Sam is loving it and right now I could use some of your “sunny”, but at least we’re not under the super storm the east is having. Dorothy, this is a great pillow. 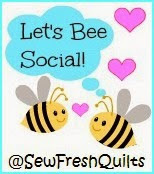 I’m stopping by from Sew Fresh Quilts. I look forward to seeing what you make this year. Great job on the pillow. Lorna’s patterns are terrific. Welcome to the blogging world. Hi Dorothy from Fairhope, Al!! I love, love the pillow and now, I’ve got to get the pattern! I have a great grandson who would love it! He’s 2 and loves all things trains and trucks! Thanks for posting the picture and good luck with your blog! I don’t have the nerve. Sandra, just jump in with two feet! I fortunately had a daughter that could help me get it set up, and I doubt it will become a huge thing, but I’m looking at it as a way to keep track of what I’m doing and my family can see also. You can do it. And, yes, your great grandson would love the train, get the pattern and get one sewn up, it’s pretty easy to do, Lorna’s patterns are great to follow. You sound like a woman after my own heart! I’m happy to find your blog–looks great so far! Lorna is a gem, isn’t she? What a talent. I LOVE your train pillow, and can’t wait to see all the other things you’ll share with us here. Best wishes and happy stitching to you! Thank you so much! Lorna is awesome, now I need to make some more pillows for my other grandkids. Hope 2018 is the best for you. Beautiful pillow, looks like a very happy boy! OMGosh! Thank you so much Cheryl, I can’t believe you commented on my picture, I read and follow you and keep hoping to make one of your mystery quilts. I absolutely LOVED the one you just finished. It’s been added to my 2018 list. That happy, shining face is what it’s all about! So glad to hear your grandson loves his new train pillow. Looking forward to seeing what you’ll be sharing next! I really appreciate your quick response to designing that pattern. Happy new year to you and yours. Hi Dorothy! What a lovely picture of your little grandson with the train pillow! I was inspired by Lorna’s patterns to make pillows for grandkids too. Two years ago I made 11 of them for Christmas and this year added one more for a granddaughter that wasn’t born yet at that time. And added a bunch of Christmas ones :-). WOW! I am going to have to go re-look at those patterns again with new eyes 🙂 11 pillows! I will not complain about the 8 I have on my list. Lorna does a great job, I started her Christmas stitch along, still have a few patterns to finish. Thanks for the kind comments. I think that smile says it all! A happy boy in love with his pillow 🙂 Popping over from Lorna’s blog to say hello and see your beautiful creation. Also, I wanted to say welcome to quilt blog land!! Thank you, Tish, it’s kind of scary to put yourself out there, but my daughters are helping (and pushing) me along the way. Super cute. I know he will treasurer for years. How do I follow you? Thank you, Nancy, he is loving it. I am still figuring out this whole blog thing, next on my list is to do the “follow me” ? can you check back tomorrow? This turned out beautifully. And your grandson looks like he loves it! So sweet that Lorna made the pattern for you, and how quickly you turned it around to make the pillow. Hi Dorothy! Welcome to the blog world, I look forward to popping in on your blog to see what lovely things you will be sharing with us and to visit with you. Great job on the train pillow! Sam’s happy little face says it all, he obviously loves his pillow! Lorna is amazing! I love her patterns too and follower her blog, that’s how I found you.? Happy New Year and may it be filled with love, laughter, good health, exciting adventures and many more blessings.?? Thank you, Tammy, I wish for you to have a great 2018 also. Lorna does do a great job, I am constantly amazed at how she can come up with the patterns she does. Dorothy-welcome to blogland! 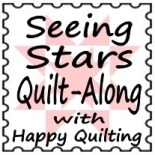 So glad you started a blog as you have wonderful quilts to show off. You did wonderful to make the train pillow for your grandson, I can tell he really liked it. I just might! I’ve been more of a “lurker”, I read a lot of blogs and am envious of everything the amazing people do. So, maybe I will be brave enough to try it. Thanks for the positive words.